The Can-Cans swept aside the Academy challenge with a potent mix of fast attacking football and clinical finishing, notably from Stuart Soane. The former Caley Thistle and Huntly striker’s brilliant hat-trick, his second in seven days, helped secure the points for the home side who have only lost twice in their last 30 starts. Man of the match Soane, who departed to a standing ovation with 13 minutes to go, said: “I’m really enjoying going back up front. I played the for the last 15 games of last season after Lee Fraser picked up his knee injury. “We are creating an awful lot of chances so I am finding it quite simple playing at centre forward for Forres, with the amount of quality players I have either side of me. Forres central defender Graham Fraser passed a late fitness test and that freed up skipper Stuart Soane to retain his place up front. Academy were without influential midfielder Sam Mackay and experienced attacking midfielder Richard Macadie only made the bench. Academy started well and in the second minute Forres keeper Stuart Knight did really well to dive to his right and turn a Davie Allan 10 yard drove past the post. 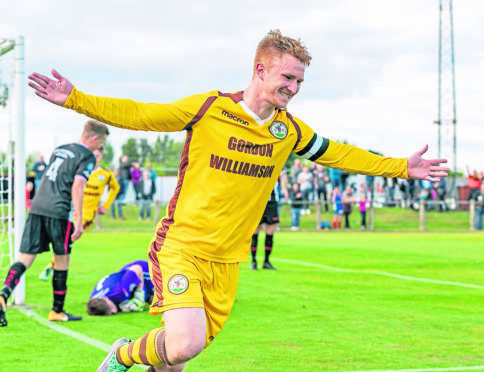 Forres Mechanics took the lead in the 29th minute, Robbie Duncanson fed Soane whose first effort was parried by McCarthy but the rebound landed back at Soane’s feet and he made no mistake second time around, hammering the ball home from eight yards. Two minutes later it was almost 2-0 to the home side when Jordan Milne drifted in at the back post but his effort hit the top of the crossbar and went over. A minute later Forres were awarded a penalty kick when Calum Howarth was upended in the box, the Can-Cans played on and Soane curled a beauty into the far corner, but referee Filippo Mazzoni had already pointed to the spot. When the dust settled McCarthy dived to his left to brilliantly palm away Alan Pollock’s penalty. Five minutes from the break only a goal-line headed clearance by Jack Henry stopped a Fraser header from making it 2-0. However, Forres’s second goal was only delayed by 60 seconds, full back Calum Howarth charging through and firing under the diving McCarthy from 12 yards, the full-back’s first goal for the club. Within 40 seconds of the restart Forres were three up, Pollock’s ball into the box was flicked on with the side of his boot by Soane and the ball flew low past the helpless McCarthy. In the 52nd minute Mechanics were on easy-street when Andrew MacRae held off a challenge to thread a pass to Soane and he buried the ball from 10-yards on the angle to complete a brilliant hat-trick. Academy’s miserable afternoon was summed up with two minutes to go when substitute Craig Gunn blasted well wide of the target from six yards. Disappointed Academy midfielder Richard Macadie said: “Stuart Soane was good up-top, he gave them something to hit, we were second to every ball, just as we were in the first game of the season at Brora. Wick Academy – McCarthy 7, M. Steven 6. G. Steven 6, Farquhar 6, D. Mackay 6 (G. Mackay 80), Manson 6, Henry 6, Halliday 6, Allan 6, MacNab 6 (Macadie 65) Hughes 6 (Gunn 65). Substitutes not used: MacGregor, Miller. Man of the match – Stuart Soane.